Headed up by powerhouse producer Jason Blum, Blumhouse Productions has been leading the way in cheaply made, highly profitable genre fare since it picked up Paranormal Activity. Of all of its fledgling franchises, (including Insidious and Sinister) the one with the most potential is The Purge and its sequel, the latter of which goes some way towards fulfilling all of the possibilities that it suggests. For those who are having trouble remembering last summer, the premise is that within a decade, the New Founding Fathers of America have tackled crime and unemployment by arranging an annual no-holds-barred festival in which all crimes, INCLUDING MURDER, are legal for 12 hours. As the Purge of 2023 commences, The Purge: Anarchy follows five people who are, for various reasons, marooned in downtown LA where they would be sitting ducks for murderous gangs and mysterious death squads, if not for the alarming preparedness of one of their number. The first film was a politically muddled affair and it's not like the sequel has entirely articulated itself properly as a cautionary tale, but at least it goes outside for some fresh air. By taking place in one home, The Purge was like a Twilight Zone episode, constricted to a home invasion thriller by a low budget and frankly side-lining the detail that all crime is legal. That narrow focus opens right up this time around. In relative terms, this is like following the claustrophobic slasher antics of Halloween with the city-wide dystopia of Escape To New York. 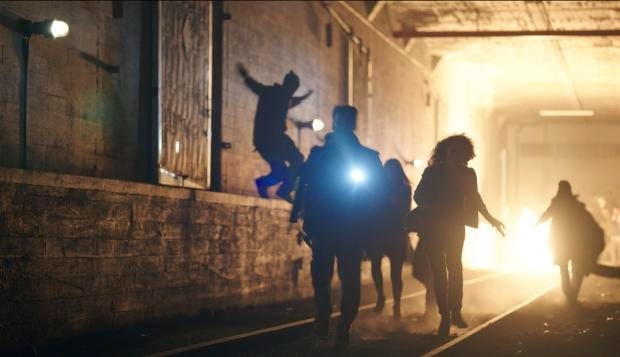 Writer-director James DeMonaco wisely moves on from the first film, which now looks like proof of concept for this bigger, more grisly affair, by really considering the ramifications of the Purge in American society. How do the poor get by in this society? Is everybody completely happy with this arrangement? How might ordinary people exploit the opportunity to sort their own life out, even if they're not usually prone to criminality? We get a number of different answers to each of these questions throughout Anarchy and the result is a more enjoyable thriller. 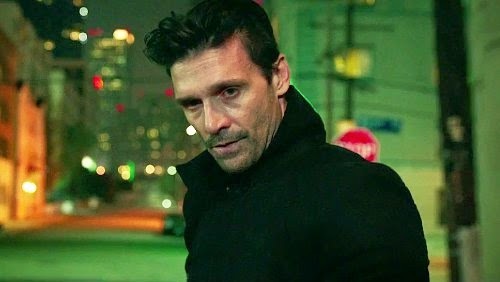 In the centre of it all, the terrific Frank Grillo takes on the de facto lead role as an unnamed vigilante who seems to have spent a lot of time gearing up to be Batman, the Punisher and Judge Dredd all at once and seek justice for a past wrong on the one night where he can get some catharsis. In the vein of other tough guys who suffer for showing compassion, his mission is lumbered by a bickering couple and a terrified mother and daughter who wind up tagging along after he saves them from execution. The cast is roundly great, with Grillo continuing his well-deserved rise to genre stardom. None of this is to say that the film is any less politically muddled, even if it's slightly more clearly set against its own premise. The implication, as ever, is that the rights bestowed by the New Founding Fathers are comparable to the antiquated right to bear arms and that just because the right is there, it doesn't mean everyone should exercise it without morality. This is more overt in scenes where Purging civilians bellow at their victims that they're entitled to kill them. But as in part one, guns still seem pretty indispensable, whether you're partaking or just trying to defend yourself, which has reportedly led to facepalm-worthy misreadings of the film by some conservative American viewers. Still, what the franchise sometimes lacks in subtlety and clarity, the sequel gains in credibility. The world feels more lived-in just by virtue of getting out of Ethan Hawke's house. 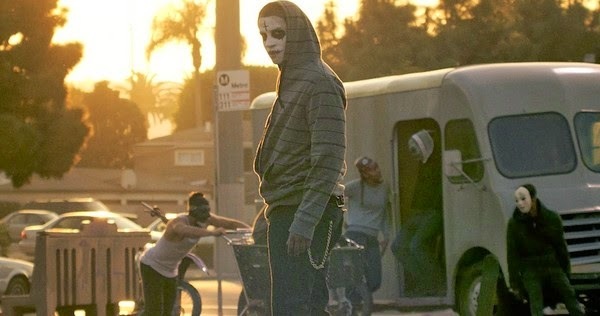 Although there's a corresponding gang of masked youths to menace our protagonists, they're part of the broader "Halloween for twats" festival feel to the Purge and there's a nice bait and switch about their intentions as the film goes on. In the background of it all, there's a resistance movement led by Michael K. Williams' Carmelo, (determinedly cosplaying as Samuel L. Jackson) which appears just enough in this instalment to get you intrigued for the inevitable third instalment, currently dubbed The Purge: Revolution. The Purge: Anarchy is a far superior sequel that might not get the kudos it deserves by dint of the first one being somewhat disappointing. It sheds the horror fixtures of Blumhouse's low-budget fare and plays more like a super-violent political action film of the type we saw in the 1980s. Too often when we refer to John Carpenter or Paul Verhoeven, it's all about an affected version of the exaggerated gore and violence which borders on silly, but with none of the smarts and resonance. Even if it's not all the way there yet, it's gratifying to see a homage that gets it the other way around. The Purge: Anarchy is now showing in cinemas nationwide. If you've seen The Purge: Anarchy, why not leave a comment below? Also, do you think they'll just give Michael K Williams a purple lightsaber on the next run around?